“....... I have instructed the Government to accelerate the creation of conditions necessary for our country’s industrialisation. Such prerequisites are: ........... the development of communication and telecommunication infrastructure. Concerning this domain, we must rapidly bridge the digital economy development gap. This is a genuine growth driver as well as a niche for new jobs for our youth. We should make the most of it. In its organisation, the Government will give this sector all the attention it deserves.” Excerpt from the Head of State’s, end -of -year address to the the nation – 31st December 2015. The National Growth and Employment Strategy Paper (GESP), designed in a bid to attain the Head of State’s vision of making Cameroon an emerging country by the 2035 threshold, portrays the creation or construction of new basic infrastructure like roads, ports, bridges as well as telecommunications and Information and Communication Technology (ICT) infrastructure as one of the major actions of the ongoing seven - year term of President Paul Biya, which he tagged a mandate of "Major Achievements" . In his December 31, 2015 address to the nation, the Head of State emphasized the need for appropriate infrastructure which he says is indispensable for the development of a modern economy. In line with the Head of State's revered instructions, the government plays a key role in the development of the digital economy and the transformation of the telecom and ICT as a whole. The construction of Broadband Infrastructure to enhance the development of the digital economy is one of the eight cornerstones with which the Digital Economy Strategy Plan, adopted by the Prime Minister in 2015, is built. 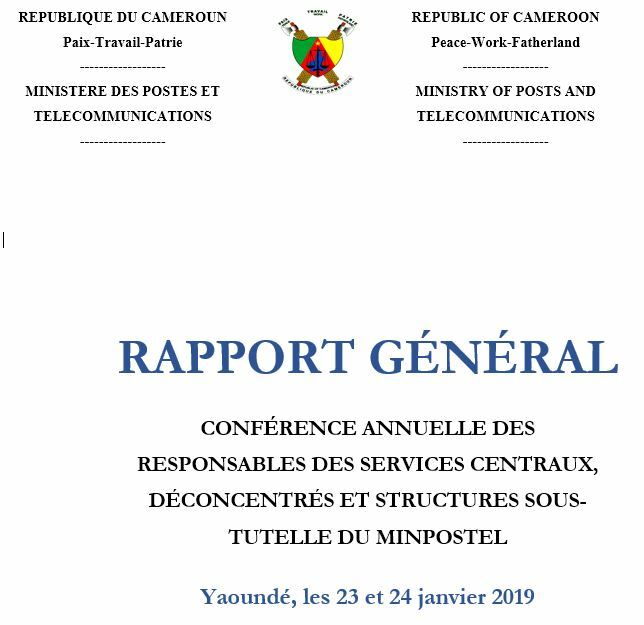 The Minister of Posts and Telecommunications (MINPOSTEL) in collaboration with some state – owned institutions in the sector, private telecommunication operators as well as other international partners, has been rigorously implementing the Digital Economy Strategy Plan. With regards to infrastructure, so far, several sub- marine cables have been and are being still installed in the Atlantic to link Cameroon to other parts of Africa, Europe and America. In fact, the Nigeria Cameroon Sub marine Cable System (NCSCS) installed with landing point in Kribi went operational in 2016 under the close supervision of Cameroon Telecommunications (CAMTEL), who has put in place a dynamic team of four (04) telecommunication engineers to ensure a 24/7 surveillance of the landing station hosted by the CAMTEL office in Kribi. The Africa coast to Europe (ACE) and the South Atlantic Interlink (SAIL) submarine cable systems are underway and once ready, will go a long way to secure access to internet in the country. In the bid to digitally develop cities in Cameroon, 313 km of urban optical loops have been deployed across major cities in the country. This project that was launched by the government in 2011, was executed to ensure the supply of high speed internet at very little cost to home based firms and the entire population. Similarly, in 2016, two Internet Exchange Points IXPs were installed in Douala and Yaoundé to reduce the cost of internet access, improve the quality of service, foster the development of local content, ensure better management of internet congestion and facilitate the investigation of cyber crimes. Still in relation to infrastructure, the National Backbone of fibre optics project has made great progress with about 12.000km of fibre optics deployed across the national territory. The Government hopes to layout 20 000km of fibre optics reaching all the nooks and crannies of the national territory and increasing network capacity. The National Backbone of fibre optics project seeks to improve the quality of service, provide black fibre for the sector’s operators and users, and increase the possibility of access to sub marine cable systems. The National Broadband Network (NBN) project which is in its completion phase, seeks to provide high speed internet services to household and businesses through the Fibre-to-the-home (FTTH) technology. The NBN project which started in 2012 has put in place infrastructure and platforms for modern telecom services like a digital billing system, the submarine cable system as well as the CT phone network. In fact some Cameroon residents now enjoy high speed access to network: High definition television systems, video protection through surveillance cameras, digital TV on IP and much more thanks to the NBN. In a similar light, the ongoing Central African Backbone (CAB) project will ensure the effective interconnection of Central African countries through a high speed optical fibre telecommunication network. It will also permit landlocked countries in the region to have access to the sub marine cable system. This project is being carried out by the Government thanks to assistance from capable partners (World bank, African development bank, Islamic development bank, ITU and AU). In the postal sector, the Government decided to put in place infrastructure that will digitally transform the sector and make posts a key tool in the development of the digital economy. The E-post infrastructure which consists of a data center and a secure network of 234 post offices interconnected by fibre optics of about 410km and by satellite with about 110 VSat stations, has enhanced the provision of good quality postal products and services. MINPOSTEL also constructed 231 multipurpose community tele - centres to promote the technological development of rural communities by giving the rural population access to ICT resources. Developing broadband infrastructure is the first strategic area addressed by the Digital Economy Strategy Plan. Cognisant of the fact that one of the major challenges for Cameroon in the sector of communication and telecommunication is to develop broadband infrastructure in order to enable the country’s integration in the global economy of knowledge, the government, guided by the directives of the plan for a “Digital Cameroon by the 2020“ is bent on utilizing all avenues and opportunities on the national and on the international to construct and install infrastructure that will place Cameroon on the pedestal of an emerging nation through complete and effective digital transformation of all sectors by the 2020 threshold.